D,113 T,5.75 Av 19.67 Magical day after rain yesterday. 24℃, no humidity. Dead to the world, the bod clock kicked in about 0700hrs. It was straight to reception for a complimentary coffee or three. I was on the road with my map that John had given me in my map holder, at last!, not having to open my bag for directions. Taking Nevada St west from town, providing time to stop for brekky at a good ol’ diner, superb spread planted before me and a local paper a guy gave me. Interesting little bunch of stats was noted in an article elaborating on the share movement: 80% of shares are owned by the richest 10% of the pop’n and the richest 10% acccount for 40% of consumer spending here in the US. Nevada Ave turns into 115, leaving Colarado Springs south. The air was crystal clear with light winds, this was so inspirational. 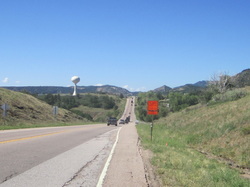 Climbing away from CS with Fort Carson on my left. I spotted some Prarie Dogs on the side of the road, further investigation lead me straight into a slurry from last nights rain, now this stuff was poo on a blanket like never encountered before. I could not move the bike as wheel movement was being obstructed by the wheel guards, a freeway shoulder was my location, the side stand came in so handy once again. Positioning it so carefully, the stand is only rated at 25kg or there abouts. I had to remove this stuff from inside the guards, pieces of wood on the side of the road were of insufficient strength. Looking around on the shoulder, the highway larder, a wiper blade steel strip was spotted. This suited the job perfectly, the issue was wear on the rear tyre. Taking my time the problem was removed. I decided to keep this handy little piece of metal, I stowed it on the pump. This piece of waste is now on for a good look around Mark Twains Mississippii. The Prarie Dogs continued on unphased. The onward portion of 115 was an on and off again roadworks affair. Much foward handedness was required, even having to cross into the oncoming lane when a gap presented itself to let cars behind me pass. Arriving at Penrose at the intersection with 50 east,west a meal was consumed. Near the intersection proper was a new retail premises. Legislation only 9 months ago passed by the state has allowed medicinal marijuana to be sold to those with a health cert. This is a first for the US. Being a democrat piece of state legislature, Obama has told the feds to just live and let live. 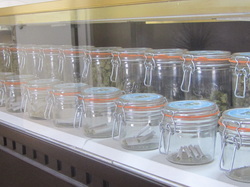 Feeling the need to look at this, I pulled in and had a yarn with the owner, nice guy, he had all the heads only product lined up in big jars with smokes of each strain in smaller jars. He was kind enough to let me take some photos. He said it was all outdoor grown and all his clients were happy with their medicine. This kind of pun warrants no excuses. He gave me the name of a doctor that may prescribe if he felt it was beneficial. 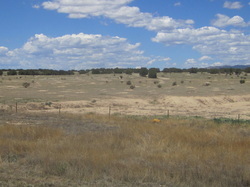 Legislation states that you must be a resident of Colarado to qualify as a buyer. We spoke at length, but in the interest of not sounding to interrogative. On leaving, conversation was directed at the Praire Dogs all over the paddock next to the shop. He mentioned the owner is going to rip the paddock. Arriving in West Pueblo, I pulled into WM and had a few sodas and phoned Tone. He was still out and about and said stay put, taking him literally I ended up falling asleep outside the place with the bike against the wall. After a great afternoon nap, all be at a less than desirable venue, Tone rang, his friend had a Pirius, not the vehicle to transport the bike. 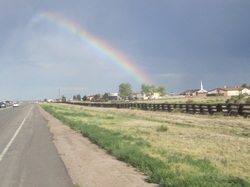 It was a wake up ride to Bernard and Ellens place in Pueblo, some further 6 miles. The ride culminated on a cycleway through the city park and zoo, so nice. Being introduced on arrival, it was nice to see Tony, Suzanne and Janie again, I heard all their horse riding stories. Ellen prepared a devine salad with home grown tomatoes and all the other goodies, enjoyed with pasta and a mexican weat dish. We took Tony and the girls to Bernards cabin where he has his horses for trail rides. Talk about friendly horses, they were like seagulls. The kids had their apple bag raided big time. I spent the night back at Pueblo at Bernard and Ellens house. So kind of them.